One of New Jersey’s historic taverns, The Black Horse Tavern has been in business more than 270 years. Located in the heart of Mendham, it was originally a stagecoach house in the mid-1700s. TRENTON, N.J.– New Jersey is a great place to find warming toddies, comforting nogs, and other seasonal libations. In fact, the third state to sign the Constitution has had a lot of practice, since it claims a collection of some of America’s oldest inns and taverns – a few established before the Revolutionary War – that continue to serve satisfied patrons. These cozy historic taverns are great gathering spots with welcoming environments that can only be found in New Jersey. For additional details, access www.visitnj.org. Moses Mount, an aide to General Washington during the Revolutionary War, returned to his beloved Freehold and began operating a tavern in his home for the local gentry and an inn for weary travelers. Moses was granted a “continued license” for “keeping a public house of entertainment,” so states the April 25th, 1787 order from the Monmouth County Court of Quarter Sessions. Earlier license dates have not been determined. However, colorful rouge that he was, Moses may have run afoul of the law: An 1880 court order required him to provide lodging only to men, stabling to horses, and to prohibit any type of gambling. Ever wonder what 20 of the world’s greatest sand sculptors can do with 500 tons of sand? The skillful art of sand sculpting has returned to its Atlantic City roots this summer as the multi-week DO AC Sand Sculpting World Cup hits the free beach again with more action, world-class sculptors and a new location. This year’s sand-sculpting event starts at noon on Thursday, June 19, and runs through the July 4th holiday weekend to Sunday, July 6. The viewing hours on the beach have been extended this year from 9 a.m. to 9 p.m. every day of the competition. The DO AC Sand Sculpting World Cup event is free and open to the public and the sand art will remain on display through July 6. Throughout the middle of June, the most noted sand-sculpting artists on the planet will be on Atlantic City’s Pennsylvania Avenue beach, adjacent to the famed Steel Pier and the Landshark Bar & Grill, crafting their masterpieces. The award ceremony — during which the final sculptures will be on display — is scheduled for 6 p.m. on Friday, June 27. Sand sculpting returned to its Atlantic City roots in a big way in 2013 with more than 130,000 people coming to Atlantic City see the sand sculpting competition. This year’s DO AC Sand Sculpting World Cup is looking to be the biggest event of its kind ever, with more talent, the biggest prize purse in the history of sand-sculpting, and the first-ever McCord Cup, named after famous sand-sculpting pioneer Philip McCord — who practiced his art, starting in the late 1890s, at the same Atlantic City beach where the competition is taking place this year —on the line. 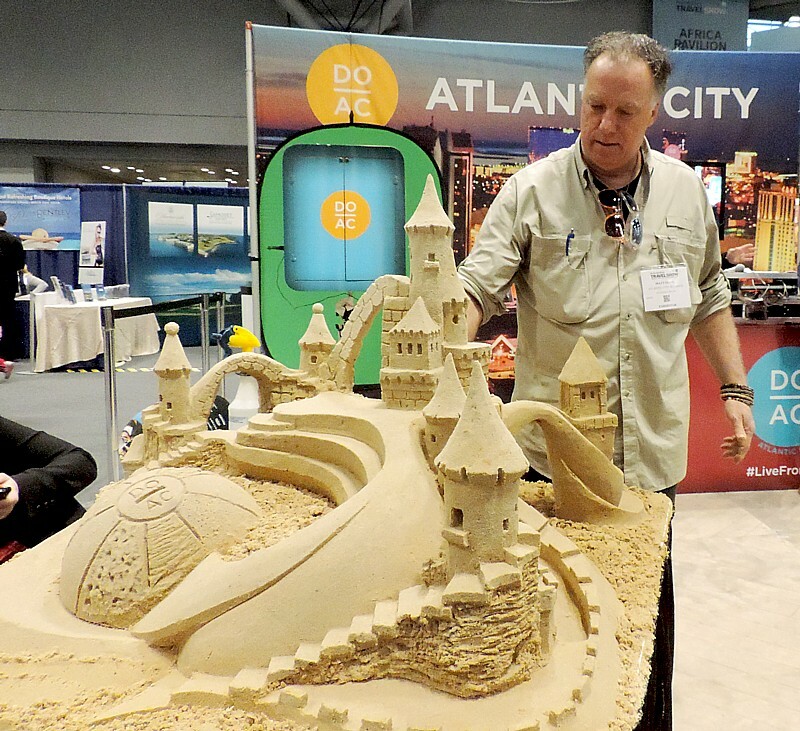 The top 20 sculptors from around the world, recruited by event director and professional sand carver, Atlantic City’s John Gowdy, will come together on the beach at noon on June 19 to dig in and begin drawing and carving their lines in the sand. Gowdy has also secured a panel of the very best judges for this year’s competition. This year’s event will include 500 tons of sand. This allows the artists to build higher and more detailed pieces. There are no agents used in the mixing of the sand during the work. It’s not until the sculpture is completed that a mix of biodegradable solution and water is sprayed on to provide a thin coating that helps the art stand up to the weather. There will be categories for both Solo and Doubles carving. The Solo competitors will be actively carving 20 sculptures from June 19-22. The Doubles teams will be carving a total of 10 sculptures from June 24-27. A demo sand sculpture created by Gowdy will be on display throughout the duration of the event and will be visible from the Boardwalk. Also new this year, Cheekoting, a game of racing plastic marble-like balls on a sand course that developed on Italy’s lively beaches after World War II will be played on site at the DO AC Sand Sculpting World Cup. This will be the first time the game has been played before the public in the U.S. The course is like a mini-golf course built in sand, with hills, valleys and tunnels. Competitors will flick their plastic marbles along a very long and winding track approximately 1-foot wide, with banked sides so the balls doesn’t leave the track. The game will played on the World Cup site, near the Landshark Bar & Grill at Resorts. To read more about this year’s event, the competitors, the history of sand sculpting in Atlantic City and for photos and video from last year’s event, visit doatlanticcity.com. Don’t miss great family fun with steamed crabs, corn on the cob, pulled pork, local and regional craft beers and all-day entertainment during a traditional summer feast at the Craft Beer & Crab Festival Saturday, Aug. 11, from 11 a.m. to 8 p.m., sponsored by the Mid-Atlantic Center for the Arts & Humanities (MAC) with major funding by PNC Bank and Gold Coast Production Management. Come to the beautiful grounds of the Emlen Physick Estate, 1048 Washington St. and stretch out on the lawn or relax under the tent during this all-day festival that celebrates the best of summer in Cape May and was named one of the 5 Best NJ Summer Festivals by CBS NY. Have fun cracking open freshly steamed crabs and savor the delicious sweetness of this summertime picnic favorite. Choose from other favorite summer foods including corn on the cob and pulled pork sandwiches. Try some French crepes or stop by the hot dog stand where you can purchase hot dogs, popcorn, cotton candy, cookies, soda and freshly squeezed lemonade. Cool off with ice cream and water ice. Wash down these delicious summertime foods with craft beer from local and regional breweries in the beer garden under a tent on the estate lawn. Purchase and enjoy a variety of local and regional craft beers from Cape May Brewing Company, Tuckahoe Brewing Company and Victory Brewing Company, from the Harrison Beverage 10-tap beer truck. Other selections will include a light beer, a hard lemonade and some non-beer beverages. Relax under the shade of the estate’s mature trees and listen to live music on the stage near Hill House. Bring a lawn chair or spread out your beach blanket for a great afternoon and evening of musical performers. The lineup begins at 12 p.m. with Reed’s Blues, a three-piece blues band. At 1 p.m. it’s the high energy meta-funk music of The JL3, comprised of local musicians Jason Brown, Chuck Embley and Tom Meehan. At 3 p.m. it’s New Pony, hailing from the City of Brotherly Love, with a raw, adrenaline-pumping funk and soul. At 4 p.m., Linwood native Dave Landry takes to the stage on acoustic guitar and at 5 p.m. you’ll hear Kelly Carvin Band with her sensual yet sweet mix of popular, rock, folk and country. At 6 p.m., Croatian-born Kruno Spisic brings his Django Gypsy jazz to the evening stage, with sweet Balkan melodies, romantic songs and jazz. In between, a DJ will keep the music going. Test your skill with games of chance at an old-fashioned Victorian carnival arcade. Jugglers and acrobats from the Give & Take Little Circus will delight and entertain all throughout the day and offer lessons in juggling. Ponies and horses will be on hand for supervised rides for children and adults. Have you ever seen a painted pony? You can “decorate” ponies in this fun, hands-on painting activity that is cool and refreshing for the horse. Explore the variety of crafts and food vendors on the estate grounds selling hand-made and vintage items. These include: Bliss Homemade Organic Ice Cream, West Cape May, N.J., with organic ice cream and ice cream sandwiches; Gindo’s Hot Sauce, Los Angeles, Calif.; The Jewelry Boutique, Downingtown, Pa., with sterling silver and gemstone jewelry; Oxford Handbags, Cochranville, Pa., with vegan handbags and alpaca wraps; and LB Tiles, Millville, N.J., with handmade and pressed tiles including Cape May Lighthouse designs. Admission to the grounds is free and free parking is available. There will be a charge for crabs, food, beverages and some activities. Commemorative pint glasses and T-shirts will be available for purchase. Proceeds of the event benefit MAC’s numerous educational outreach programs. The Craft Beer & Crab Festival is sponsored by MAC with funding provided at the “King Crab” level by PNC Bank and Gold Coast Production Management and at the “Horseshoe Crab” level by Exit Zero and the Fairthorne Bed & Breakfast. The Mid-Atlantic Center for the Arts & Humanities (MAC) is a multifaceted not-for-profit organization committed to promoting the preservation, interpretation, and cultural enrichment of the Cape May region for its residents and visitors. MAC membership is open to all. For information about MAC’s year-round schedule of tours, festivals, and special events, call 609-884-5404 or 800-275-4278, or visit MAC’s Web site at www.capemaymac.org. For information about restaurants, accommodations and shopping, call the Chamber of Commerce of Greater Cape May at 609-884-5508. Become Immersed in Victoriana this fall during Cape May’s 39th annual Victorian Weekend, Oct. 7-11. Tour historic homes, taste the local flavors and celebrate Cape May’s special history as the nation’s first seaside resort. Sponsored by Cape May’s leader in historic preservation,the Mid-Atlantic Center for the Arts & Humanities (MAC), the event captures the feeling of the City’s “gilded age” with charming tree-lined and gas-lit streets, hundreds of Victorian era landmarks, and a week of special events and tours including historic house tours, ghost tours, food and wine events, living history programs and more from Friday, Oct. 7 through Tuesday, Oct. 11. The Chocolate Championship Tour & Tasting. Saturday, Oct. 8 from 1 p.m. to 3 p.m., will have you sampling the best chocolate desserts from Cape May’s historic properties, Inns and B&Bs. Taste, tour and vote! Will it be the chocolate torte, fudge bars or mousse? Only you can decide! Those who turn in completed evaluation cards will get recipes by email. Limited to 200 tickets. Admission is $25 and $15 for children (ages 3-12). 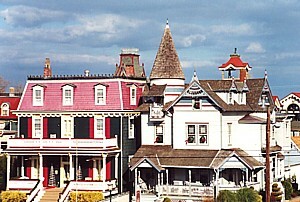 Many of Cape May’s regal Victorian residences are reputed to host more than the living. Experience the “other side” of Cape May on the Historic Haunts Combo Tour on Friday, Oct. 7, Saturday, Oct. 8 and Sunday, Oct. 9 at 7:15 p.m. Get into the spirit of things on a trolley tour down Cape May’s gas-lit streets, past some of Cape May’s haunted Victorian homes and then visit Cape May’s original haunted house, the Emlen Physick Estate, for a guided tour with a discussion of Victorian spiritualism and today’s paranormal investigators. Admission is $20 for adults and $15 for children (ages 3-12). The Historic Haunts House Tour portion of the tour can be purchased separately from the Combo tour. The house tour is offered on Friday, Oct. 7, Saturday, Oct. 8 and Sunday, Oct. 9 at 7:45 p.m. and costs $10 for adults and $7 for children (ages 3-12). Waltz your way back in time during the Vintage Dance Weekend on Saturday, Oct. 8 and Sunday, Oct. 9. Vintage Dance Instructor Martha Griffith will have you kicking-up your heels like they did in Cape May’s Victorian heyday as she teaches you the popular ballroom dances of the mid- and late-19th Century at a Vintage Dance Workshop at the Franklin Street School, Franklin and Lafayette Streets, on Saturday, Oct. 8 from 9:30 a.m. to 3 p.m. Then, put your newfound expertise to good use at a costumed Vintage Ball at the Cape May Elementary School, Lafayette Street at Madison Avenue, with live music of the period by Spare Parts on Saturday, Oct. 8 at 8 p.m. On Sunday, Oct. 9 at 2 p.m. enjoy an elegant Tea Dance, also with live music by Spare Parts, at Cape Island Baptist Church Hall, 115 Gurney St. Refreshments are included at the Ball and Tea Dance and Victorian costume is highly encouraged (but not required). An all-inclusive package is available or you can purchase events individually. Dance Weekend Package $95; Ball $35; Tea Dance $25; three Workshops $45. New this year is the Fudge Fantasy with the famous Fudge Kitchen. On Sunday, Oct. 9 at 2 p.m., the original Fudge Kitchen will be displaying its hand-whipped creamy fudge in an array of flavors at the Inn of Cape May, 7 Ocean St. Sample the famous fudge flavors, learn how they make the fudge and much more. Admission is $15 per person. Discover Cape May’s seventh annual Designer Show House, a harbor-side homeowner’s dream. This $2.2 million four-story luxury townhome at Osprey Landing at Cape May Marine, overlooks the harbor and wetlands and is open daily for tours through Oct. 30. Self-guided tours are offered daily from 1 p.m. to 4 p.m. and guided evening tours are offered at 7 p.m. every Thursday, Friday, Sunday and Monday. Each visitor receives a full-color program book with information about the designers, products and vendors. Admission is $15 for adults and $10 for children (ages 3-12). Osprey Landing is conveniently located at 109 Rosemans Lane at the end of the Garden State Parkway. There is free off-street parking available and an elevator with access to all four floors. Tours of the Designer Show House can also be combined with daily luncheon, dinner (Thursdays, Fridays, Sundays and Mondays) and Happy Hour packages (Mondays through Fridays). New in 2011! Murder at the Physick Estate presents “Doorway to Darkness,” a newplayby John K. Alvarez. Is there life after death? Do spirits wander on an ethereal plane? Are there ghosts roaming Cape May? Tonight, with the Physick Estate as a backdrop, a psychic and a scientist plan to address these questions once and for all. Plans go awry when a seemingly innocent children’s nursery rhyme turns the evening upside down. A visit to the Physick Estate becomes much more than a look into the past for one of them. Afterwards, meet your evening’s performers over coffee and dessert in the Carriage House Tearoom & Café. Performances are offered on Friday, Oct. 7 and Saturday, Oct. 8 at 6:45 p.m. and 8:30 p.m. Admission is $25 for adults and $20 for children (ages 3-12). Celebrate Oktoberfest at the Mad Batter Beer Dinner on Friday, Oct. 7 at 7:30 p.m. The famous Mad Batter restaurant, 19 Jackson St., is serving a four course Oktoberfest dinner featuring German beers. Admission is $65 and seating is limited to 60. Celebrate the fall season at the Scarecrow Workshop on the grounds of the Emlen Physick Estate, 1048 Washington St., on Saturday, Oct. 8 from 10 a.m. to 2 p.m. Gather your scarecrow-making materials and visit the Emlen Physick Estate with friends, family and co-workers where you and your team can receive straw and stakes to create a scarecrow for the Estate’s Scarecrow Alley, a highlight of the Estate’s Halloween decorations. All creations will be entered into the Scarecrow Alley competition. Registration is required. Please call 609-884-5404 ext. 111 to register. Rain date is Sunday, Oct. 9. Go beyond the doors of a selection of charming private cottages in the Cape May area that are not normally open to the public during the Private Homes Tour on Saturday, Oct. 8 from 11 a.m. to 1 p.m. The tour is limited to 300 tickets. Admission is $15 for adults and $10 for children (ages 3-12). Discover the fun and follies of Cape May’s history on the Cape MayUnzipped Trolley Ride. Cape May celebrity Tom Carroll takes you on a narrated ride through the streets of Cape May, giving a “tongue in cheek” look at the fun and follies of life in a resort town. Tours are offered on Saturday, Oct. 8 at 2:30 p.m. and 3:45 p.m. and on Sunday, Oct. 9 at 2:30 p.m. and 3:30 p.m. Admission is $10 for adults and $7 for children (ages 3-12). On Saturday, Oct. 8 at 3 p.m., spend the afternoon touring the award-winning Cape May Winery in North Cape May. The Winery Cellar Tour & Tasting features a tour of the vineyard to see how the grapes are grown and then a visit to the winery, where you’ll be introduced to the winemaker’s art and enjoy a barrel tasting accompanied by cheese and fruit. Admission is $20 and includes a complimentary tasting glass. Did you know there was once a “South Cape May?” On Saturday, Oct. 8 at 4 p.m. at the Episcopal Church of the Advent, Washington and Franklin streets, co-authors of “Remembering South Cape May: The Jersey Shore Town That Vanished Into the Sea,” Robert Kenselaar and Joseph Bucher will present a free lecture. Kenselaar is the guest curator of this new exhibit at the Carriage House Gallery that examines the rise and fall of the community that once stood west of Cape May’s beachfront on land that today is the Nature Conservancy’s Cape May Migratory Bird Refuge. In its heyday, the town of South Cape May had more than 40 homes and hundreds of summer residents. The exhibit in the Carriage House Gallery located on the grounds of the Physick Estate, 1048 Washington St., is open daily through Nov. 6. Admission is free. This exhibition was made possible by a grant from the New Jersey Council for the Humanities, a state partner of the National Endowment for the Humanities. Any views, findings, conclusions or recommendations in this exhibition do not necessarily represent those of the National Endowment for the Humanities or the New Jersey Council for the Humanities. Murder is on the menu during the Murder Mystery Dinners. The Impromptu Players invade the dining room at the Inn of Cape May, 7 Ocean St., where they set the scene for a new mystery that will surely be a barrel of fun. The new mystery, “A Very Noir Pinot,” creates an atmosphere of foul bouquet, intrigue and deceit. Interact with the cast of likely suspects and try to solve the mystery as you enjoy a three-course dinner or luncheon. Dinners are offered on Saturday, Oct. 8, Sunday, Oct. 9 and Monday, Oct. 10 at 7 p.m. and admission is $45. Limited event; reservations are necessary. If you have a taste for history, take the Champagne Brunch Walk on Sunday, Oct. 9 at 10 a.m. First, build up your appetite with a walking tour of Cape May’s Historic District, and then enjoy a Southern-style breakfast buffet with mimosas at the historic Chalfonte Hotel, 301 Howard St. Admission is $20 for adults and $15 for children (ages 3-12). Open daily from 11:30 a.m., the Carriage House Tearoom & Café located on the beautiful grounds of the Emlen Physick Estate, 1048 Washington St, is a great way to enjoy an English tradition in Victorian Cape May. The Tea Luncheon features sandwiches, salads, soups, breads, pastries and beverages, and the Elegant Afternoon Tea includes finger sandwiches, pastries, scones and beverages. The café menu also offers heartier fare with a selection of entrée salads, soups, sandwiches and wraps. To make reservations call 609-884-5111. “The Doctor is in”on Sunday, Oct. 9, from 10 a.m. to 4 p.m. Meet Dr. Emlen Physick as he greets and banters with visitors on his Estate’s grounds at 1048 Washington St. Enjoy an Emlen Physick Estate tour with its new theme in 2011: “Victorian Health & Fitness.” As your tour guide leads you through each room in the Estate, you’ll hear about Victorian exercises, diets, food preservation methods, medical beliefs and practices, fitness attire and much more. 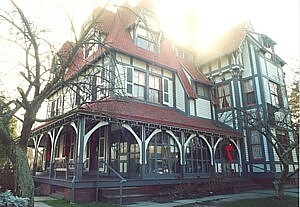 The Emlen Physick Estate, Cape May’s only Victorian House Museum, is open daily. Tours of the Estate cost $10 for adults and $5 for children (ages 3-12). On Sunday, Oct. 9, the Victorian Weekend Crafts & Antiques Show sets up on the lawn of the Emlen Physick Estate, 1048 Washington St. Crafters and antiques dealers from throughout the region will display and sell their unique and hand-made wares from 10 a.m. to 4 p.m. Admission is free. To drink or not to drink, that is the question at the Tea Luncheon & Temperance Debate on Tuesday, October 11 at 12:30 p.m. at the Carriage House Tearoom & Café located on the grounds of the Emlen Physick Estate, 1048 Washington St. Saloonkeeper Patrick Collins and Jennie Wales, staunch advocate of the temperance movement, debate this most important topic. Join Dr. Physick as he attempts to maintain decorum during this spirited debate. Admission is $25 and includes an Elegant Tea Luncheon. The event is limited to 50 guests. Advance reservations are highly recommended. The Cherry House, a beautiful private home built in 1849 in the Federal style, situated on one of Cape May’s oldest residential streets, Hughes Street, will opens its doors for tours daily at 2 p.m. during Victorian Weekend. Tickets cost $10 per person ($8 for children ages 3-12) and are available at the Washington Street Mall Information Booth. Spend an afternoon during Victorian Weekend touring the wineries of Cape May County at your own pace during the Self-Guided Wine Trail. Visit Natali Vineyards and Hawk Haven Vineyard & Winery and taste wines at each. Admission is $8 and includes a map with the wineries listed, tastings at both wineries and a complimentary tasting glass. The Self-Guided Wine Trail is offered daily from 12 p.m. to 5 p.m. Attend world-class theater productions in Cape May with Cape May Stage and East Lynne Theater Company or check out a film at the Cape May Film Society. Cape MayStage presents “The Woolgatherer” on Friday, Oct. 7, Saturday, Oct. 8 and Sunday, Oct. 9 at 8 p.m. Rose, a shy cashier prone to daydreaming, and Cliff, a rough-edge trucker with a solitary life, are an unlikely couple both looking for love in a world gone mad. Despite their mutual fear of commitment, these two lonely souls are drawn to each other and somehow manage to find comfort in each others’ uniqueness. Can a candy counter girl and foul-mouthed truck driver find love in South Philly? Funny and poignant, this gripping play answers the question with humor, humanity, and just a touch of crazy. Performances take place at the Robert Shackleton Playhouse, corner of Bank & Lafayette streets. General admission is $35, $30 for seniors (62+) and $15 for students. East Lynne Theater Company presents “Dulcy” on Friday, Oct. 7 and Saturday, Oct. 8 at 8 p.m. and Sunday, Oct. 9 at 7:30 p.m. Dulcy is a comedy by Pulitzer Prize-winners George S. Kaufman and Marc Connelly. In trying to help her husband, Dulcy alienates his boss and complicates matters with her other weekend guests. The original 1921 production not only established the reputations of Kaufman and Connelly but made a star of Lynn Fontanne who played Dulcy. Performances take place at the First Presbyterian Church, 500 Hughes St. General admission is $30, $25 for seniors, $15 for students and ages 12 and under are free. The Cape May Film Society presents “Tospy-Turvy” on Sunday, Oct. 9 at 7:30 p.m. In this zany 1999 comedy set during the Victorian Era, Gilbert and Sullivan threaten to disband after their latest play is critically panned—that is until the two are inspired to write the masterpiece “The Mikado.” Location TBA. Tickets are $10. Cape May’s Victorian Weekend is sponsored by the Mid-Atlantic Center for the Arts & Humanities (MAC), a multifaceted not-for-profit organization committed to promoting the preservation, interpretation, and cultural enrichment of the Cape May region for its residents and visitors. MAC membership is open to all. For information about MAC’s year-round schedule of tours, festivals, and special events, call 609-884-5404 or 800-275-4278, or visit MAC’s Web site at http://www.capemaymac.org. For information about restaurants, accommodations and shopping, call the Chamber of Commerce of Greater Cape May at 609-884-5508. Put on your boaters and bustles and celebrate Cape May’s unique heritage during the 39th annual Victorian Weekend, sponsored by Cape May’s leader in cultural and heritage tourism, the Mid-Atlantic Center for the Arts & Humanities (MAC). Experience Cape May’s “gilded-age” with trolley tours down the gas-lit streets, tours of Victorian-era homes and inns, food and wine events, living history programs, lectures, workshops, performances and more from Friday, Oct. 7 through Tuesday, Oct. 11. New for 2011: discover Cape May’s seventh annual Designer Show House, a four-story harbor side homeowner’s dream, satisfy your sweet tooth with a Cape May institution at Fudge Fantasy, an event co-sponsored by the famous Fudge Kitchen, dare to attend the new Murder at the Physick Estate production, gather some hay and stakes and make a creation for the Physick Estate’s Scarecrow Alley, and learn about South Cape May, the town that vanished into the sea, during Cape May’s Victorian Weekend. Returning favorites will have you kicking up your heels as they did in Cape May’s Victorian heyday, touring Victorian gems, tasting innkeeper’s chocolate desserts, solving a murder mystery during lunch or dinner, touring the wineries of Cape May County and more. The Mid-Atlantic Center for the Arts & Humanities (MAC) is a multifaceted not-for-profit organization committed to promoting the preservation, interpretation, and cultural enrichment of the Cape May region for its residents and visitors. MAC membership is open to all. For information about MAC’s year-round schedule of tours, festivals, and special events, call 609-884-5404 or 800-275-4278, or visit MAC’s Web site at http://www.capemaymac.org. For information about restaurants, accommodations and shopping, call the Chamber of Commerce of Greater Cape May at 609-884-5508. We just discovered a fabulous getaway destination a mere 1½ hours south of Manhattan: Red Bank on the New Jersey shore. We found one of the most fabulous 7-mile biking trails on Sandy Hook, part of Gateway National Park, that is so scenic and so interesting, and even more so because of a long history as a fort (you can see battlements that were revolutionary in their day, from 1890s and buildings that housed soldiers) that spanned the eras from the mid-1800s, through World War II, the Cold War and the Missile Age. It also has Sandy Hook Lighthouse, the oldest operating lighthouse, dating from 1764, not to mention gorgeous sandy beaches, water on both sides, and a popular destination for fishermen and birdwatchers. After biking, we went into historic Highlands, enjoyed a delightful lunch on the water at the Inlet Café, before exploring Twin Lights, a phenomenal lighthouse which turns out to be the first place where Fresnel’s lens was used (and after that, Congress made it the standard illumination for all lighthouses). It’s also where Marconi demonstrated his wireless invention. The structure is fascinating, and you can climb to the top for an amazing view – in fact, it is the highest point (we are told), on the Eastern shore – and for that reason, has been an observation post for military and commercial reasons since Colonial times. We thoroughly enjoyed our stay at the riverfront Oyster Point Hotel – recently renovated and thoroughly contemporary and charming. We especially loved the patio with plush sofas and pillows, where we could enjoy morning coffee and croissant. It also has a fitness center, beautiful lounge. The views of the river (especially from our room, 510, on the highest floor), are just glorious (www.mollypitcher-oysterpoint.com). 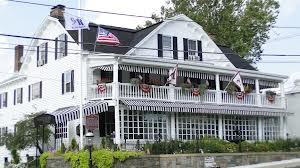 Its sister property, the Molly Pitcher Inn, just around the corner, is completely different in style – it dates from 1928 and is very traditional, but shares the same quality of excellent service and elegant guest amenities. It also has an outdoor swimming pool (in season). The village of Red Bank is charming with red brick sidewalks, planters, and whole blocks of Victorian buildings dating from the second half of the 1800s, and lovely cafes with outdoor dining. We were surprised to see two music shops – Jack’s Music Shoppe, and a guitar store and all sorts of boutiques, not to mention various and sundry investment banks and brokerages that are very telling about who lives in the neighborhood (hint: Bruce Springsteen and Jon Bon Jovi). What is more, you can reach Red Bank and the Atlantic Highlands without a car – take a ferry from Manhattan (www.seastreak.com), or by North Jersey Coastline train from Penn Station (www.njtransit.com). Check out the full story and photos at http://www.travelwritersmagazine.com/TravelFeaturesSyndicate.